Saturday morning I dreamed of Steinway, my beloved dog of 16 years, my first dog, the dog the Lord used to help me heal from a season of deep brokenness. In the dream, I was the 2017 me, with my current level of joint pain and limitation; Steinway was the old dog and full of days, circa 2008. He wanted me to lift him onto my lap, but he was too heavy for me. With immense effort, he made the jump and snuggled up between my leg and the arm of the chair. As is usual for me, the dream was in color; as is not so usual for me, I could feel the weight of him and touch his fur. The only other thing I remember of the dream is that we were at my husband's parents' home, and it was full of people, as it was for the two memorial services this year. We had taken Steinway with us because he was too frail to be left with anyone else. I woke missing him more than I have in a long time. The memories of his final months came rushing back. This loyal dog, who had awakened in the night with me so many times when illness or jet lag or simple insomnia took me from bed, would wake almost every night between 2 and 3 am. He would find his way to the living room and then start yelping with enough insistence to wake me up. Sometimes he needed to go outside and was telling me the only way he knew. Most of the time, though, I think he was lonely and afraid. 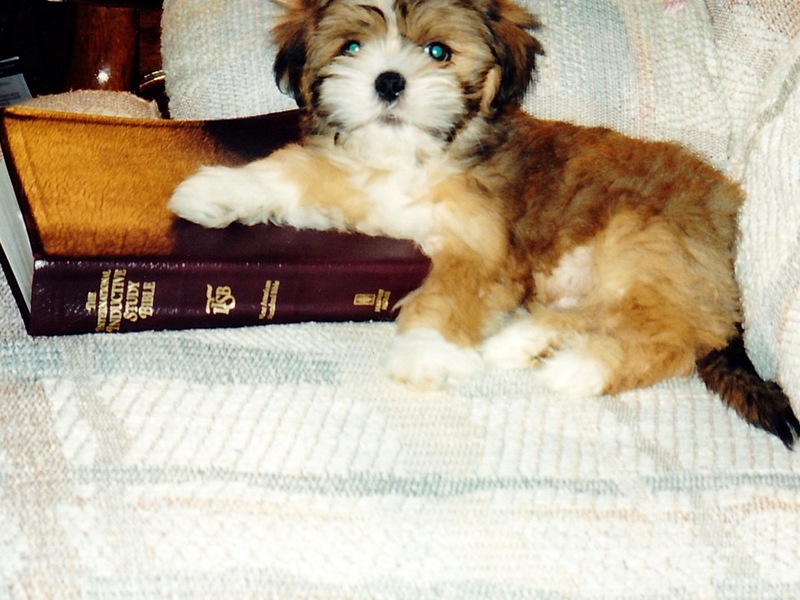 A Bible study friend suggested that dogs could develop dementia like people do, and perhaps his days and nights were mixed up. Whatever the reason, he was unable to soothe himself and go back to sleep without help. I would pick him up and do the rock-and-bounce walk known to all parents and babysitters until his ragged breathing slowed and he began to calm down. "It's okay. I'm here. You're okay," I would whisper. When he was calm enough, we would lie down on the sofa, me on my back, Steinway on my chest like an infant, my arms around him, stroking his fur. There we would stay until we both fell asleep. Unaccustomed to sleeping on my back, I would wake after half an hour, give or take, and oh so carefully rise and carry him back to his bed in Amore's and my room. One night when I was unhappy to be awakened and growing impatient with Steinway's needs, the Lord reminded me that this was the least I could do for the dog who had done so much for me, and that my days with him were numbered. Soon I would long for that middle-of-the-night closeness and the weight of my puppyface in my arms. And then He showed me the parable in the experience. If I, being evil, sacrificed sleep and came at the sound of my dog's frightened cry, how much more can I trust that the Lord hears and heeds the cries of His blood-bought daughter? How much more will He console and comfort? How much more will He be with me in the dark nights of my soul? That's where Advent joy comes in. The "good news of great joy" the angel announced to the shepherds was that a Savior, a Rescuer, had been born for them (Luke 2:8-14). Yahweh their God had seen their sins and oppression and heard their cries, and He had come Himself to rescue them. He had entered their affliction as a baby, but this baby was the virgin-born Immanuel whom Isaiah foretold: "God with us" (Matt. 1:22; Isaiah 7:14). In the apostle John's words, this baby was the Word who became flesh and tabernacled among us (John 1:14). This baby was the "consolation of Israel" for whom Simeon waited in the temple (Luke 2:25). The good news of "God with us," right in the middle of our mess and sin, in the middle of the night, in affliction, in the cries of our hearts--that is the beginning of Advent joy. His presence is the joy and comfort of the people He has redeemed. How shall we respond? Shout for joy, you heavens! Mountains break into joyful shouts! and will have compassion on his afflicted ones (Isaiah 49:13). Isaiah's joy was too great for him to give adequate expression to it with his own solitary tongue, so he called on the great mountainous masses of inanimate nature to express the greatness of God's love and tender mercy in comforting his people. And, when we come to think of it rightly, we see at once that it is a theme for wonder, worthy of the consideration of heaven and earth that the infinite God should stoop so low as to comfort finite and fallible creatures such as we are. Were there no more worlds to be created? Were there no other deeds of power and glory to be performed so that he must come to this poor earth to comfort the sick, the sad, and the sorrowing? The Lord is great in the majesty of his power, but he is equally great in the condescending character of his love and compassion. After Jehovah's great creative works were done, the creation must not be slack in its music when his condescending works are done also--when from the highest heavens he stoops to those in deepest woe to lift them up from their sins and sorrows by the power of his eternal compassion. Dear Crumbles, does this Advent find you, perhaps, not feeling the joy the carols proclaim? Does the call to rejoice feel like one more burden too heavy to bear? Then cry out to your Master and Savior. Cry to Him, and keep crying until the Comforter ministers grace to your heart. Meditate on the wonder that "the infinite God should stoop so low as to comfort finite and fallible creatures such as we are." Consider the greatness of "the condescending character of his love and compassion." Dare to believe the good news of Christmas, that "from the highest heavens he stoops to those in deepest woe to lift them up from their sins and sorrows by the power of his eternal compassion." Seek Him in the Scriptures, in prayer, in His people, and He will be found by you. Lean into Him; lay all the weight of yourself and your concerns on Him, and let Him comfort you. Rest in the reality of "God with us," of "God with you," and let His presence be your joy. Father of mercies, comfort our afflictions. Amen.